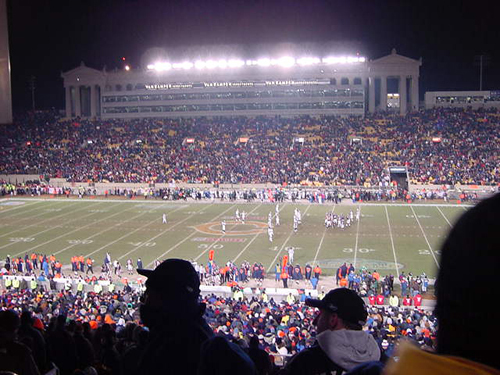 Soldier Field was opened in 1924 as a 45,000-seat Municipal Grant Park Stadium. The first football game played on its field was November 22, 1924, as a capacity crowd watched NotreDame edge Northwestern, 13-6. It hosted the first boxing event which drew a gate of over $2.5 million (Dempsey-Tunney, 1927), the first ski meet held in a stadium, and the all-time largest football crowd (123,000). The largest crowd for any event in Soldier Field was 260,000 on September 8, 1954, for the religious Marian Year Tribute. The 100,000-seat stadium was dedicated November 27, 1926, with Army battling Navy to a 21-21 tie. The all-time collegiate attendance record of 123,000 plus was established November 26, 1927 as Notre Dame beat Southern Cal 7-6. The Bears have called Soldier Field home for more than thirty years after playing their first 50 seasons in Chicago at Wrigley Field. In the first professional game at the then-mammoth stadium, the Bears defeated the Chicago Cardinals 10-0 on November 11, 1926. Plans for the stadium started in 1919 as a memorial to the soldiers of WWI. Soldier Field stands on 10,000 pile foundations driving an average depth of 62.5 feet through fill that replaced the lake waters. The stadium is maintained and operated by the Chicago Park District. 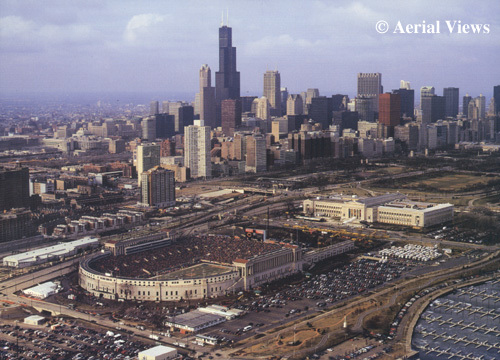 1971 - September 19th, Chicago defeats the Pittsburgh Steelers 17-15 before capacity crowd of 55,701 in the Bears' first game since moving from Wrigley. 1979 - The stadium undergoes major reconstruction and renovation prior to the season including new lighting, playing surface, and locker rooms; rebuilding of seating area (new chairbacks, armrests, seats); and improvement of sightlines. 1982 - Additional rebuilding of seating areas was completed as well as new concourses with more restrooms and concession areas. A new press box, 60 deluxe skyboxes, and a new scoreboard were also built. Capacity is increased to 66,030. 1988 - Surface was changed from artificial turf to natural grass, and 56 skyboxes were added along south rim (increasing the total to 116). Capacity is increased to 66,946. 1992 - Four seats are added increasing the capacity to 66,950. "Even after 70 years, people still have a hard time getting its name right: It's Soldier Field, not Soldier's Field. 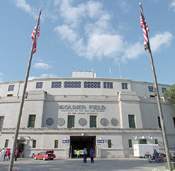 Opened in 1924 as a memorial to the men and women who served in World War I, Soldier Field faithfully has served the Windy City by hosting everything from boxing matches to religious conventions. Its best known tenants, the Bears, have called the place home since 1971. Before then, the Bears shared the Cubs' den at Wrigley Field, but the Mike Ditka years - all played in the shadows of Soldier Field's majestic columns - have made this stadium as much a hallowed place as the "friendly confines" of Wrigley Field. With Lake Michigan to the east and the downtown skyline serving as an impressive backdrop to the north, Soldier Field's location is awe-inspiring. As befits the Windy City, breezes that range from comfortably cool in September to downright arctic in December often blow across the stadium. Still, on a Monday night game with the skyline lighted, the view is magical enough to make fans forget they're frozen stiff. Despite talk about the Bears building a stadium in the next decade, Soldier Field probably will continue to stand tall and proud for many years to come. An $18 million face lift (the third in 15 years) in preparation for the World Cup helped spruce up this grand old park, one of the elder statesman of NFL stadiums." On December 6, 2001 Al Bunescu wrote: Seems you forgot about the Chicago Rockets with Angelo Bertelli in the late '40's, and the midget, motorcycle,and stock car racing that went on there over the years. Also, I meant to include the fact that the Chicago Public and Catholic Championshp games were played there in the 40's and 50's. The largest crowd ever to see a high school championship game was at Soldier field when Buddy Young played there in the early 40's. Over 120,000 people were there when they still had the south stands open. He went on to star at U of I. I had the privilege of playing there for Schurz High School for the City Championship in '45 against Tilden High. We tied, 7 to 7. We lost the coin toss to play Austin. Tilden and Austin also tied, so there were three city champions that year. You're right. Soldier Field has a RICH history. I'm so very happy they're not tearing it down, but adding to it.